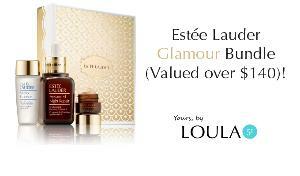 Contest: WIN: the Estée Lauder Glamour Bundle! WIN: the Estée Lauder Glamour Bundle! Prize: Bundle ($140 Value) includes: Advanced Night Repair Synchronized Recovery Complex II, New Advanced Night Repair Eye Supercharged Complex Synchronized Recovery, Micro Essence Skin Activating Treatment Lotion.